Sadie has worked at Latics since 2004. She’s a Grade 6 instructor (the highest grade) and really enjoys teaching people from all walks of life. Sadie is a fabulous instructor and you’ll find learning to drive with enjoyable and a breeze! Three words to describe me: Professional, conscientious and FUN!!! 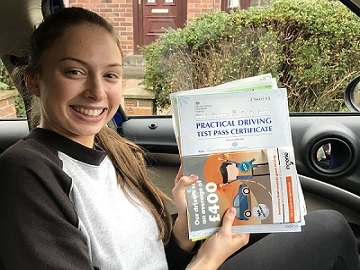 Sadie gives driving lessons in Saddlewoth, Delph, Denshaw, Diggle, Dobcross, Uppermill, Greenfield, Grasscroft, Oldham, Lees, Springhead, Scouthead, Waterhead, Sholver, Derker, Mossley, Moorside and Mossley. “Sadie taught me to drive. She is a great instructor who I would recommend to anyone. “I Would like to give a huge thank-you to Sadie Parsons, I Was extremely nervous about learning to drive and very worried going into my first lesson. Sadie was brilliant putting me at ease very quickly and then continued to work on my skills and confidence through our lessons until I was ready for my test. Her good humour and patience were certainly tested during our early lessons, but the relaxed environment in the car helped me improve and meant my nervousness soon disappeared so I could focus on improving my skills. Sadie was always on time and professional with lessons, fitting around my work schedule. She taught me how to drive a car and not just pass my test always giving me confidence in my abilities so that I now enjoy driving. Amazing 1st time pass Chloe! Great 1st time pass Ellie! Great pass only 2 faults! 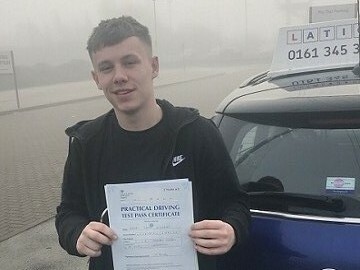 Amazing 1st time pass Andy!